Well it has been a while since i wrote my blog!!! Im actually in sweaty Thailand at the moment but have finally found the time to tell you about my last 2 weeks in NZ! So everyone came back from their glacier walks and although i was gutted they did tell me i didnt miss out on a hell of alot which is good!! Next stop before hitting Queenstown was lake Wanaka where we actually got to stay in a hotel for the night which was good apart from those bournemouth boys waking up early again and jumping around like kids... its been like this every morning for the whole of NZ nearly! Still... better than being boring! Lake Wanaka was a small town we just all chilled out i got my head re-shaved and had a nice drink with spinks, then that night we went to the local bar played some killer pool, which northern Danny won so us two and the 2 irish girls Caroline and ? got rather drunk!! Good night though! Then off to Queenstown in the morning, where we had a big group photo where infact our driver managed to get naked next too all of us in the photo without anyone realising!! It is a classic picture! So we checked into Base in Queenstown and this place is like adventure and party capital!! So many bars and so many didfferent things to do from quad biking to sky diving to white water rafting to actually flying your own planes!! All good if you hadnt had to revisit the hospital after the had just phoned you!! Yep thats what happened to me. So off i go to see the doctor who turns out to be from Dartford!? She says that ive ruptured my RCL, thats my crutiate adn ill need surgery but she said that can wait till i get home, so ill just look like a cripple fo rthe rest of my trip!! There was one thing i wanted to do though and that was Bungy and you never guess what the doc said it'll be fine!! Wooo Hooo!! Just need to convince the actual bungy company now!! So this included jumping up and down in a shop and pretending to kick balls where they still werent sure so i actaully went all the way up to the 3rd biggest bungy in the world and had to beg 5 memebers of staff before they said yes!! OH MY GOD.. i now have to jump. They basically just strap you up the 1... 2... 3... BUNGY!!!! It was the most exillarating and scary thing ive ever done, more so than the sky dive cause you are the one who actually has to jump!! There was 5 of us boys who did it and we were all buzzing after even though Paul and Tim looked like he was gonna be sick and Nick and Ryan had jelly legs!! If anyone has ever thought about doing it strongly recommend you to do so... it is the nuts!! So we spent a further 5 days in Queenstown which was eral fun spending some time getting to know everyone, having a laugh etc before we all went our seperate ways again!! We ate at the famous FERGBURGER possibly the best burgers ive ever ate and had amny a drunken night out with evryone including our driver dallas whos split personallity was out for the noght, Darrien... dont ask! Me and danny again went out with the irsih girls who were unrecognisable when dressed up in heals!! Its so strange cause im now used to seeing girls just in flip flops and not particually dressed up.. so that was nice. lol. I really enjoyed queenstown the place had a buzz about it and it was good that there was so many of us hanging around evenif you lost people you were bound to bump into someone you know!! Its surprising how close people can get and how friendly they are within such a short space of time!! We finally had to say opur goodbyes to the likes of the germans, a few posh girls and the eski (bournemouth boys!) It was sad ut then again we knew we would see them back home fo sure! lol. We then went to Christchurch This w3as our last trip with Dalls i think he was quite sad to see us go well kates assets anyway!haha. But i got hes detaila cause he has a business venure which he wants me involved with so NZ in the future could be a possibility!! Christchurch was pretty boring with not alot to do!! We spent a day going to the museum and the cathedral but they were nothing exciting and only about 50 years old!! So a few nice chilled out days! Then on to another place which i cant remember the name of.. met a couple of cool lads but now we are going back to the same places and i was more looking forward to not doing much and just getting to Thailand! Here Kate went whale watching and saw one whale then was sick for the next 3 hours!! I so wish i was there to take pics but unfortunatly i wasnt.. i did feel a little sorry for her though cause i hate being sick! Next stop was Wellington the dread place of where i hurt my knee!! Turned out to be ok and i actually stayed another day when kate went on to go watch the cricket with a couple of the lads!! Was a good day if a little boring and was very strange not having Kate around! I caught up with her the following day though in Taupo and too my surprise 3 of our good mates from Oz were there... Nicole, Shaf and Rob and what a quality day and night we had, especially cause it was Paddys day!! Out came evreything green including having fake tattoes put on our faces!! A good crowd of us went out and drank guiness and beer with green colouring in it!! HAd a good laugh and was good seeing them again! 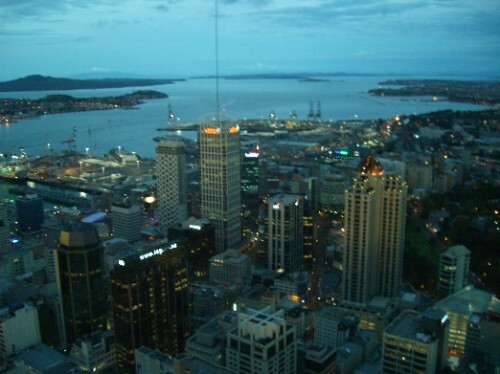 Next day we headed straight to Auckland the place it began almost a month ago!! Had a good few days where we actually had one more night with the bournemouth boys whcih included someone being bum faced, someone falling off thier chair and lots of stupid dancing!! Then nearly more tears when they left!! We also spent the days with our new little crowd, nicole and co, Vicky who we left in Darwin and even someone we left in Brisbane, Will and Laura met us for 1 night!! The few days included drinking rice wine, something that just had the percentage of the alcohol on it, sunbathing on the roof, getting numerous girls to cook for me, seeing Brendan Cole from strictly come dancing running down the street... Classic!? Racing car game and dancing machine against Kate, seeing the worst film in the world - Jumper - and alot of lazying in the sun. It was a nice way to finish off NZ. All in all... New Zealand was the best, i had the best time and met some people who i know are friends for life!! The Kiwi Experience was quality and it sums it up really the experiences i had were some which i will never ever forget!! So thats that.. i had to sum that up a little due to this all happening over 2 weeks ago now! Im now in Thailand and some stories have already formed, i will go into detail on another blog! But put it this way the weather is fantastic but im gutted really gutted to say that Katie has decided to go home early, ill go into more detaill later! But dont worry all is cool, i think she is just really missing home!! Dont be too scared though... im not coming back just yet, having far too much fun!! Chow for now people... Thailand blog will be up in due course.